"I'd knock your brains out, if you had any." Apparently having run out of themes for their Stooges discs, Columbia accumulates five shorts that have nothing in common except similar titles. They cover nearly the entire range of the Stooges' career, from one of their earliest Columbia films to one of the later Shemp releases. Alas, this means that the disc is slightly shortchanged, with only five shorts instead of the customary six. Since three of them are excellent vintage Curlies, however, the sting is lessened. Three Arabian Nuts (1951) features Shemp prominently. Working in a warehouse, they are demolishing a shipment of china and other materials from the Orient in their usual way when Shemp finds a lamp that turns out to be none other than Aladdin's magical lamp. Shemp wishes for a "snoot suit" but there are a pair of scimitar-wielding Arabs intent on recovering the lamp by any means necessary. Only one face slap and no eye pokes, but so many head conks I lost count completely somewhere north of 20. Probably the weakest short on the disc, but still quite good. The boys are working at the Panther Brewery in Three Little Beers (1935). While loading kegs onto a truck, they get wind of a golf tournament that has a hundred dollar first prize. Quickly abandoning their job to wreak havoc on the links instead, this one is a nonstop riot with the Stooges at their best: deflating the upper crust. When finally chased off the course they resume with the beer truck, only to end up with a situation clearly inspired by Laurel & Hardy's The Music Box—except this time with runaway beer kegs. Despite having the feel of two shorts pasted together, Beers is hilarious, classic Stooges. Eight slaps, six conks to the head and two eye pokes (plus two blocked pokes). 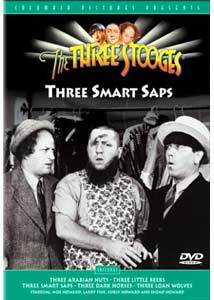 The title short, Three Smart Saps (1942) has the trio ready to get married. But they can't because the father of their intendeds, the warden of the local prison, has been framed and in the hoosegow himself. After several vain attempts to get themselves arrested, the boys break into jail and attempt to get the goods on the bad guys. This involves crashing a fancy-dress gambling party being held in the jail and getting photographic evidence. This routine features tons of inspired Curly dancing material as well as the usual poking at the stuffed shirts. In the only moment of express imitation I can recall in a Stooges short, Curly also does a brief but wicked Jimmy Durante impersonation. Six slaps to the face, two head conks but no eye pokes make this one of the least violent shorts on the disc. It does, however, have one of the great Curly lines, in response to being told ordinary people don't get arrested: "We're not ordinary people. We're morons." Three Dark Horses (1952) finds Moe, Larry and Shemp as janitors, appointed as political convention delegates for the corrupt Hammond Egger. The convention is mostly offscreen for budgetary reasons, but the boys manage to make a mess of their hotel room, and then the convention as well by throwing their support (for cash) to Abel Lamb Stewer. Unfortunately, they trot out the tired parrot-hiding-in-the-cooked-turkey routine that takes up far too much running time and isn't remotely funny. Two face slaps, three head conks and a hefty four eye pokes (plus another one blocked). Wrapping up the package is the late Curly short from 1946, Three Loan Wolves. As the title implies, the Stooges are now running a pawn shop. Focus here is on Larry, who haplessly lends money on fake musical instruments and winds up with a baby. In the background is a protection racket run by Butch McGee (Harold Brauer). There's some inventive material in this short, and plenty of gutbusting violence with seven slaps, nine conks to the noggin and a pair of pokes to the eye. Even though Curly was ill by this point, and he has a fairly small part, the group still manages to put together a funny and inventive show. Image Transfer Review: This disc features the best looking transfers yet in the series; it appears that Columbia may actually have started to do some restoration work on these shorts. There are still some occasional speckles, and exteriors can be a bit contrasty and lacking in shadow detail, but the interiors are all finely detailed with a nice range of greys. There are one or two brief momentary instances of frame jitter, but overall these shorts look the best I've ever seen them. Audio Transfer Review: Three Little Beers, as the oldest short, unsurprisingly has a fair amount of hiss and background noise. The others are fairly quiet and sound very nice indeed. Of course, there's no hope for the tinny Stooges theme music, but the dialogue is generally clear and noise- and distortion-free. Spanish tracks are included for all shorts, and Portuguese for three (Beers, Dark Horses and Loan Wolves), but no French audio, as usual. Do the French not appreciate the Stooges? Extras Review: As is the case with the other discs in this series, there are no extras. Chaptering is limited to one per short, and there is no 'play all' option here. This requires a trip to the menu in between each short, which is rather annoying if you want a Stooges overdose. Five classic Stooge shorts, with a couple of great Curly episodes, get a very nice transfer, though still no extras at all.